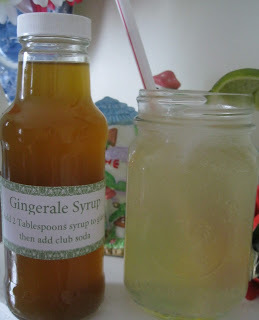 Making your own drink syrup concentrates such as Lemonade, Limeade, or Soda Pop Concentrates such as this Ginger Syrup for gingerale, are easy to do. They are basically a water/sugar syrup with added flavorings, and only take about 30 minutes to do. They make a great little gift also. What I love about this Ginger Syrup is that it can make not only traditional Gingerale, but can be made into a Ginger "Tea" to help with nausea. Would make a great gift for someone suffering from morning sickness, or Chemo treatments, or even the stomach flu! I used recycled chili sauce bottles from my last batch of meatballs, they make a perfect bottle for giving as a gift. I found these great free printable labels too! Peel and dice ginger root. In Saucepan over med.-high heat stir sugars and water together. Quarter the lime and toss into the pan. Heat to boiling stirring occassionally. Once boiling, turn down to medium -low heat and stir in the ginger root pieces. Let simmer 30 minutes. Let cool. Then pour through a fine mesh strainer or cheese cloth into container. Label with the following instructions and store in refrigerator. Pour 1-2 Tablespoons ginger syrup into serving glass. Stir in 8 oz. cold seltzer or club soda water. serve with ice and a lime wedge! Pour 1-2 Tablespoons into a tea cup, stir in 8 oz. of hot water. Sip slowly and relax!